The Ukrainian “jeansa” phenomenon—covert political or commercial advertisement, when one can’t draw a clear line between journalism and propaganda—is deeply rooted in the Soviet journalistic tradition. Especially when combined with the possibilities of the digital era, “jeansa” must be taken into account when viewing political coverage by popular Ukrainian news outlets. In fact, some of the news media in the country are like a false mirror, where a low-rating politician can be seen as a potential winner of the presidential race. Ukraine’s most popular newspaper, the Russian-language Segodnya (Today), is definitely one such false mirror. However, the paper is an interesting case, because it simultaneously promotes several candidates with opposite political programs, with clear “jeansa” signs visible in the texts covering both pro-Ukrainian and pro-Russian candidates. It’s hard to imagine any peaceful communication between, for instance, the radical populist Oleh Liashko and candidates from the Opposition Bloc Party (Liashko was once even attacked by one of them, Yuri Boiko). However, Liashko and members of this bloc peacefully coexist on the pages of Segodnya—so readers might perceive this imitation of discussion as a real and balanced one. 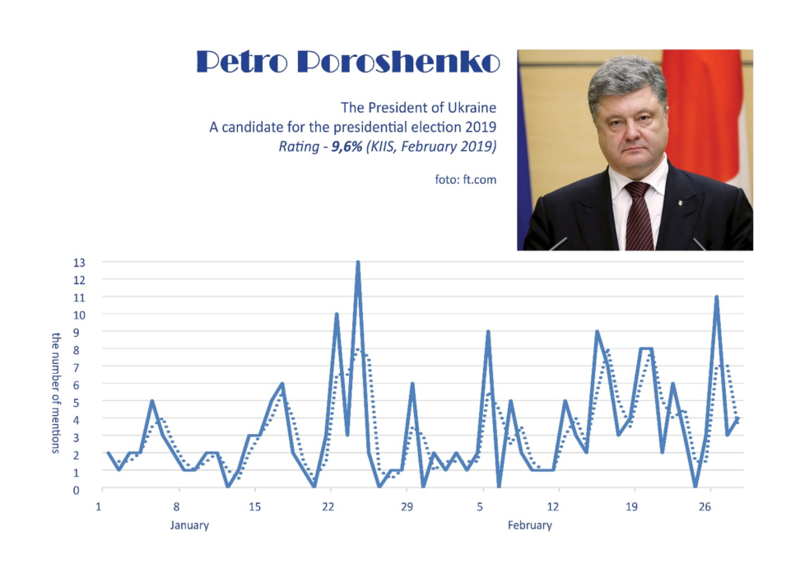 To determine the paper’s approach to political coverage and the specifics of “jeansa” messaging in Ukraine, content analysis was performed on texts published in Segodnya’s “Politics” section during a two-month period (January–February 2019). Headlines mentioning a politician or presidential candidate formed the sample, with the results charting all the mentions on a timeline. Thus, based on who was mentioned and when, it should be possible to ascertain the difference between real news reporting and specially created attention (“jeansa”). And in addition, of course, we’ll be able to see whether all the presidential candidates are given equal coverage by the newspaper. What should a politician should do in order to be covered in the mass media? Their PR manager may create a special occasion—something important or unusual, with a conflict, local angle, or increased scale for added attraction. However, a “jeansa” text doesn’t necessarily contain these news components, or even a news peg. Moreover, journalists may publish whenever a client demands it, and as a rule, clients want their name to be used as frequently as possible. That is how we defined the specially created attention generated by “jeansa” items. If a politician is in the centre of an actual newsworthy topic (a scandal, a discussion, an investigation), he or she usually gets several mentions per day. In these digital times, readers’ attention increases and decreases rapidly, and the corresponding line chart shows a wave-like trend. However, if “jeansa” is used, then we have intermittent single mentions for an extended period, and there is no wave. Let’s analyze several examples. Here is Oleksandr Vilkul’s line chart. 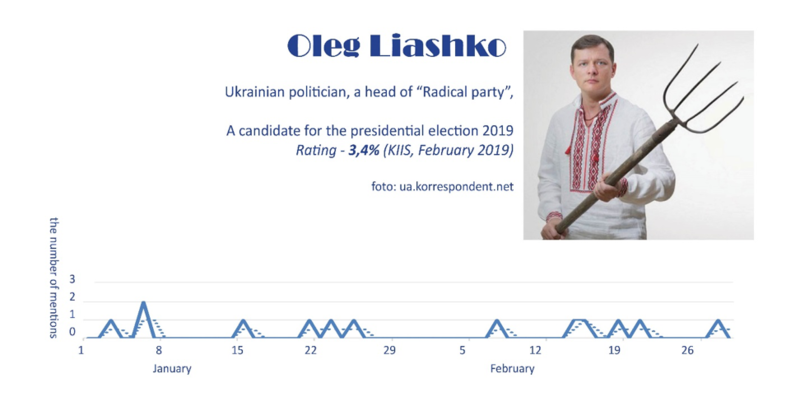 According to a recent KIIS poll, 1.7% of Ukrainians are ready to vote for him. However, Segodnya has been constantly publishing his statements on various topics. Ukrainian media experts consider the owner of the paper, oligarch Rinat Akhmetov, to be a supporter of Vilkul. So, we may suppose that the majority of mentions about Vilkul do not have any informational value, and that a normal newsworthy attention curve (wave-type trendline) would be absent. Thus, between 1 January and 28 February there were twenty-two mentions of Vilkul in Segodnya; the paper published news about him once or twice per day, and the mentions emerged on a regular basis. Confirming our supposition, the trendline is not significant. 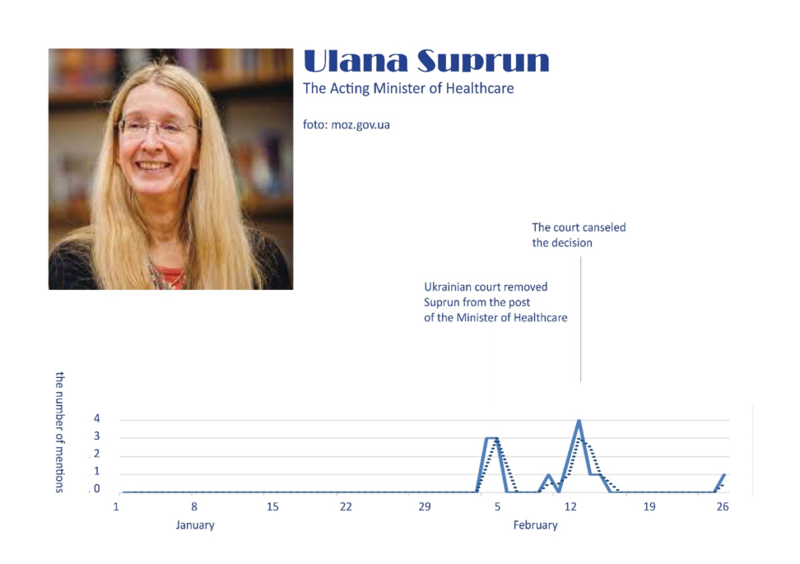 Next, here is Uliana Suprun’s line chart for mentions in Segodnya. Suprun is the Acting Minister of Health Care, and she is not running for president. However, in February a Ukrainian court removed her from the position, which became a newsworthy item. We can see that in the same timeframe, the sixteen mentions about the minister are distributed in a different way. There are two periods when she was in the centre of attention: 5–6 and 11–16 February; and in January Segodnya didn’t mention Suprun at all. So, here the trendline is different. We have the two waves, while at other times during the period the paper was silent about the minister. This is an example of normal attention, which wasn’t “specially created” (“jeansa”). Using the same technique, we can identify another “jeansa hero”—Oleh Liashko, the head of the Ukrainian Radical Party. Liashko is famous because of his unusual methods of attracting attention (once he took a cow to Ukraine’s parliament, the Verkhovna Rada). 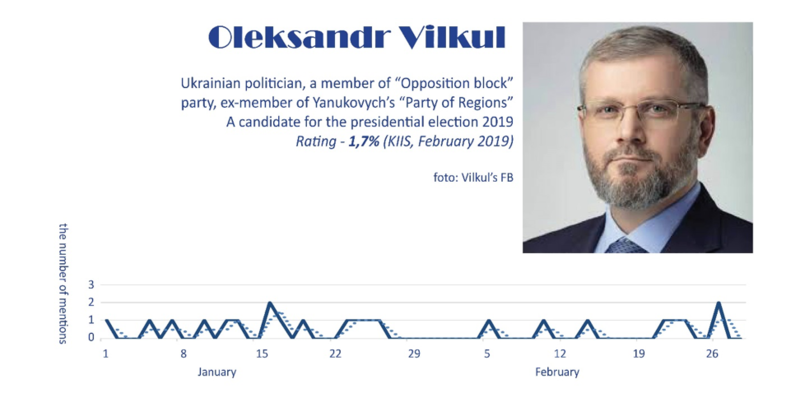 This politician is currently running for the presidency of Ukraine, and his rating is 3.4%. In the majority of instances Segodnya mentioned him only once per day, with thirteen total mentions. The longest silent period was eleven days, between 26 January and 6 February. 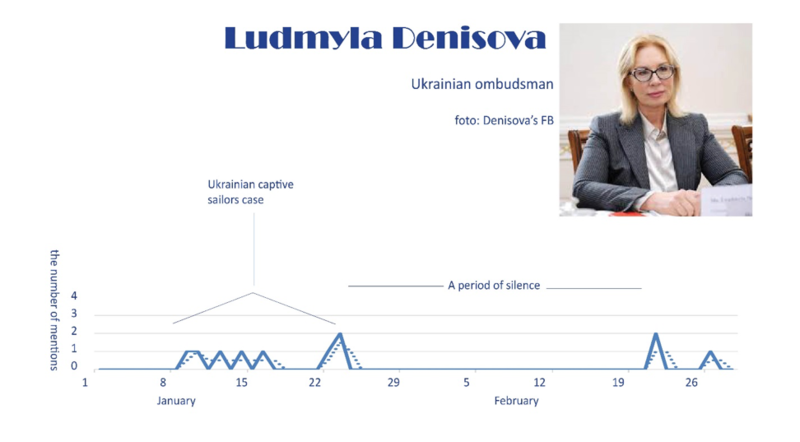 Next, we compare the line charts of Liashko and Liudmyla Denisova, the Ukrainian ombudsperson. During the study timeframe, Segodnya published Denisova’s comments about the Ukrainian political prisoners in Russia. This topic kept her fairly constantly in the news. Here also, we have only one or two mentions per day, because Denisova wasn’t in the centre of a scandal—like Suprun, for example. However, the coverage about the Ukrainian political prisoners was usually centred on certain personalities, and the topic had some development. In the case of the Ukrainian captive sailors, the first news item was Denisova’s statement about her readiness to visit the prisoners of war, and after that she reported on the circumstances of their detention and the court hearings. Thus, we do not necessarily see a significant wave-like trendline here, but there are several adjacent periods of moderate interest interspersed with periods of silence. Sometimes our attention curve methodology prompts further investigation. For instance, while there is a lot of “jeansa” about Arseniy Yatsenyuk, the former Ukrainian Prime Minister, his line chart profile differs from those of Liashko and Vilkul. 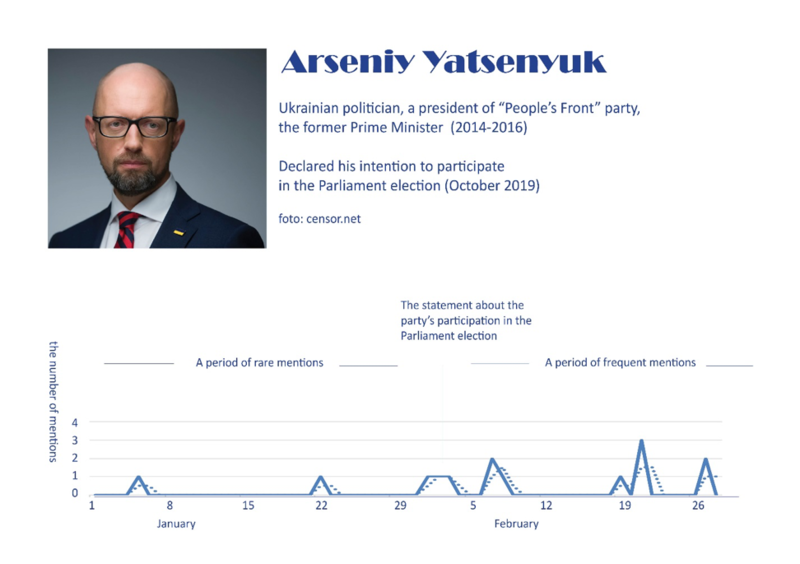 Yatsenyuk isn’t running for presidency; however, his political technologists are perhaps using the period of the presidential campaign to promote Yatsenyuk’s political party, with an eye to the future parliamentary elections in October. Here were don’t see the same frequency of mentions (as in Vilkul and Liashko’s cases), and the insignificant number of mentions per day may demonstrate that there is “jeansa” messaging going on. Regardless, another reason Yatsenyuk’s case should be analyzed further is because he might have joined the campaign later than the rest. There were some rumours regarding his intention to run for president. Thus, the period of analysis in his case could be shifted (not January–February, but February–March), and then we might see a pattern with a high density of periodical mentions. Sometimes the attention curves of Ukrainian high-ranked officials may look like “jeansa” messaging, so there is reason to investigate further. For instance, let us compare the cases of Yatsenyuk and Yuri Lutsenko, who is the Prosecutor General of Ukraine. 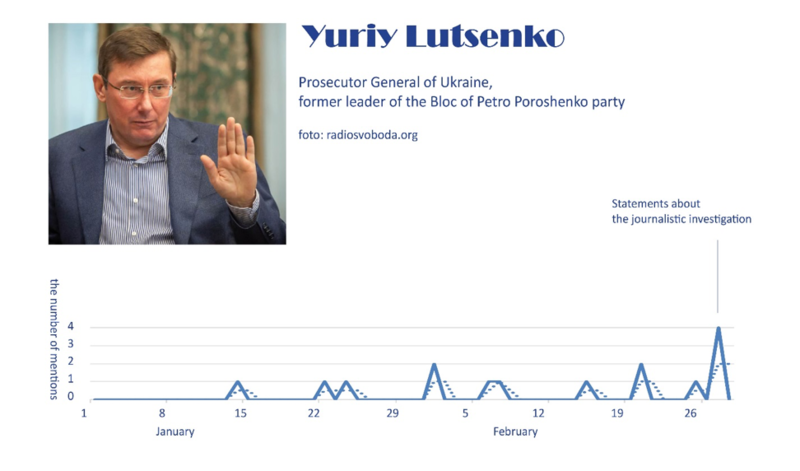 Here we have the same numbers of mentions as in the “jeansa” cases of Vilkul and Liashko; however, there is one period when Lutsenko was legitimately at the centre of attention, on 27 February. That was the day when Lutsenko commented on an investigative journalism report on corruption in Ukraine’s defence industry. Some of the mentions about Groisman do have “jeansa” features; however, the PM is an object of constant interest for journalists, so our curve method is not applicable in this case. To identify “jeansa” items, if any, the whole aggregate of texts about a given person needs to be analyzed. This is true for other high-ranked officials, including the President of Ukraine and the Minister of Foreign Affairs. 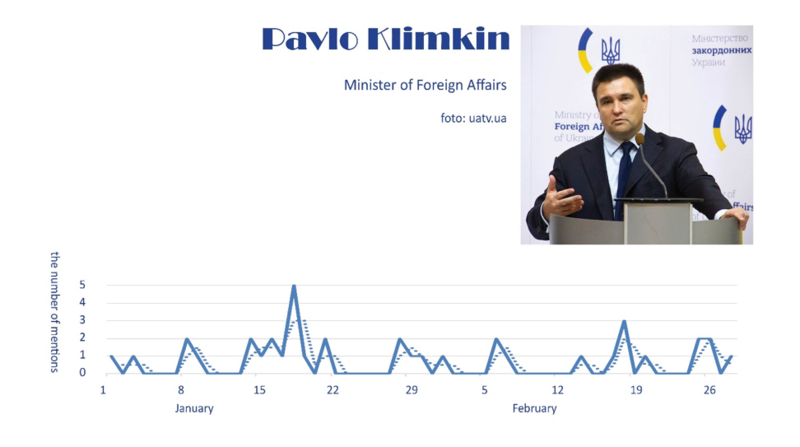 Speaking of Pavlo Klimkin, who heads the Ukrainian diplomatic corps, we can see that he is the most popular minister, with thirty-eight mentions in Segodnya during the study period (while the prime minister only has eighteen). Note, however, that this attention is distributed unevenly, with journalists mentioning him constantly but with periods of high and low attention. Unsurprisingly, Petro Poroshenko is the most popular politician in Segodnya, and in his case we can also see (as with Klimkin) periods of high and low attention. However, “jeansa” pieces on Poroshenko are also detectable. Is there a correlation between number of mentions and a candidate’s rating? In Ukraine, ninety-one candidates submitted documents for the participation in the presidential election. Forty-four of them were registered by the Central Electoral Commission. According to Ukrainian legislation, all candidates may address the public with the help of mass media, and for their part, the media should be just and balanced in their coverage of the candidates. However, journalists usually pay more attention to the politicians who have a realistic possibility of winning. Therefore, there might be some correlation between candidates’ ratings and number of mentions of them in the media, if attention is paid to covering all sides of the political debate. Let us now compare the results of the latest polls and the number of mentions in Segodnya of the presidential candidates. It appears that there is no correlation in the numbers for the study timeframe. The three front-runners in the presidential race are Zelensky, Poroshenko, and Tymoshenko, but Segodnya has given publishing preference only to the incumbent president. Of course, high-ranked officials everywhere have priority (see, for example, L. Bennett’s indexing theory). 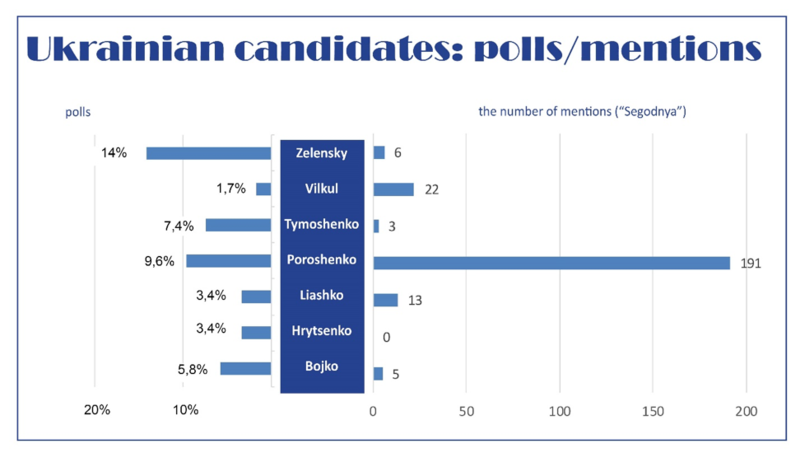 However, on the paper’s site Zelensky and Tymoshenko (16% and 9% in the polls, respectively) lose out in coverage to Vilkul and Liashko (1% and 4%, respectively), and the paper doesn’t mention Hrytsenko in this period at all. Boiko was only criticized, reported as a candidate whose rating was falling, and the content about him appeared to be manipulated. In sum, the Segodnya site has covered candidates explaining their political programs, answering critics, etc., and also those who are mentioned only occasionally. According to the agenda setting theory, the media tell us which events and personalities are important. Thus, Zelensky, Tymoshenko, and Hrytsenko may be perceived as not being strong enough for the political fight, who have nothing important to say, etc. On the other hand, other candidates who are constantly mentioned benefit from such coverage. The particular features of “jeansa”—absence of a proper news occasion to justify publication and propensity for repeated non-newsworthy mentions—make such items easy to detect. Of course, there are some complex cases with high-ranked government figures, where “jeansa” may be mixed in with pieces of real journalism; such cases should be analyzed separately. However, analysis of headline mentions may show the difference between real news and specially created coverage. 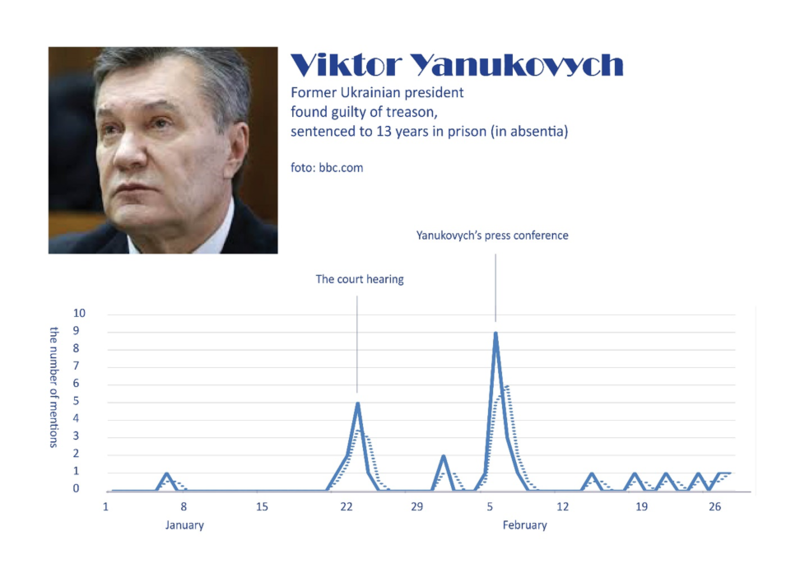 In the oversaturated environment of the Ukrainian mass media market, the analysis could be further modified with some computer methods. There are several examples of such an approach. 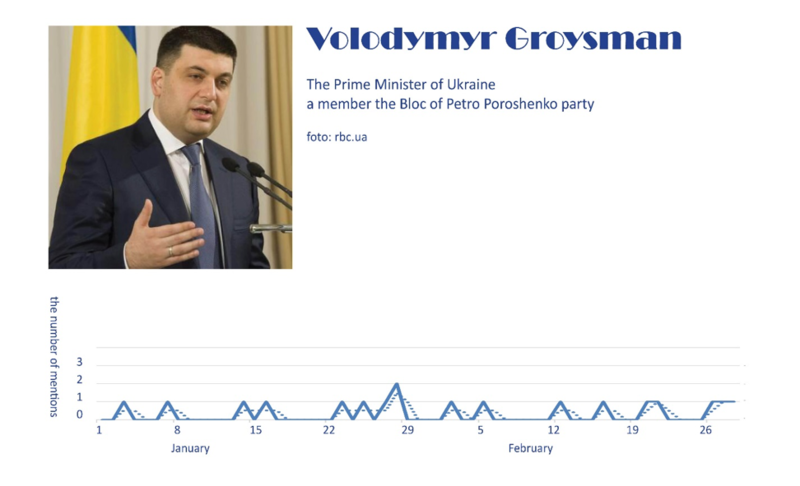 For instance, the site texty.org.ua created a visualization that detected and revealed bots among the Twitter followers of Ukrainian politicians. Another project focuses on the powerful Ukrainian politician Volodymyr Medvedchuk, analyzing mentions of him on different news outlets. Meanwhile, our study has considered all the politicians mentioned in a single popular news outlet. Further research may provide other perspectives on “jeansa” analysis, and the above charts could then be supplemented with additional information (e.g., type of news, topics). For instance, in “jeansa” cases candidates usually comment on many different issues that could be analyzed individually. And thus far we have predominantly dealt with their statements, not events or facts per se. “Jeansa” in Ukraine continues to undermine both good journalism and legitimate political communication. The Pylyp Orlyk Institute for Democracy, a Ukrainian NGO, discovered that the number of “jeansa” publications usually doubles during an election campaign. In addition, experts at the Institute of Mass Information (IMI) have estimated that 78% of journalists feel angry because of “jeansa” messaging in their field. And Ukrainian sociologists have recently stated that 57% of Ukrainians are aware of “jeansa” items in the mass media. So even though the majority of professionals and ordinary readers can detect such “advertorializing,” political powers continue to use “jeansa” and thereby hinder any real political discussion. Instead, there is only an illusion of it. Segodnya, like many other popular Ukrainian news outlets, publishes the stated policy positions of different politicians—both government officials and opposition leaders. However, it does not distinguish clearly between real and specially created news and statements. The above-mentioned IMI experts call the phenomenon “jeansa pluralism”; in such cases, however, when several politicians are presented in a news outlet, there is no real dialogue between them. Balance, completeness, and other journalistic standards are not followed in “jeansa” items, and “debates” are not properly moderated. There is no fact checking, nor are expert opinions solicited, and thus news outlets are turning into bulletin boards, where virtually anyone may add a pronouncement. As a result, readership feels frustrated and becomes distracted from politics and journalism, and Ukraine’s fledgling civic society—born in the harsh events of the Euromaidan—remains disconnected and confused. To hold government and political processes to account in the country for the sake of its very future, the Ukrainian public needs quality journalism where real political dialogue is promoted and should flourish.